A couple of weeks ago, our excellent local riding club New Barn Riders held a couple of ‘taster’ sessions to try horse agility. Horse agility is an inhand discipline where the horse and handler negotiate a series of challenges and obstacles while maintaining a close bond and excellent communication. It’s a competitive discipline, with events held all over the country, but it’s also great practice for any horse and handler. It strengthens the trust bond between you and your horse, as well as being good exercise for elderly horses or those that are out of work. 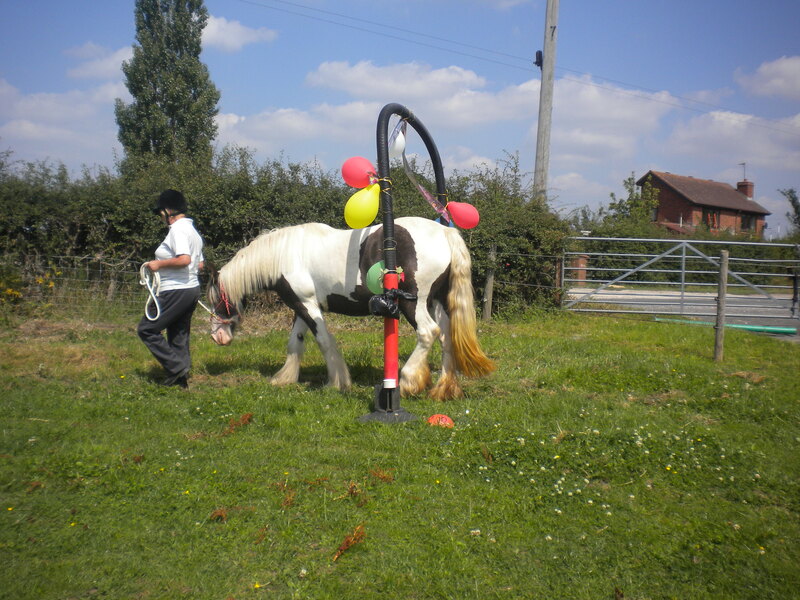 Horse agility needs little specialist equipment, and can be practised more or less anywhere that’s secure. For early training, you can use a headcollar and leadrope. Long ropes (10 feet) are better than standard leadropes, as they give the horse space to retreat while remaining under control. The handler should wear a hat, gloves and sturdy boots, at least for the initial session. Once you’ve built up a good bond with your horse, you can remove the headcollar and have your horse at liberty, moving by your side. The session was led by expert Dawn Roberts, of Freedom Equine in Dunham Hill, Cheshire. Blue can be quite spooky with certain obstacles, although she’s generally much better with me on the ground rather than in the saddle, so I was looking forward to seeing how she’d take to this. Our group contained a mixture of horses and ponies. 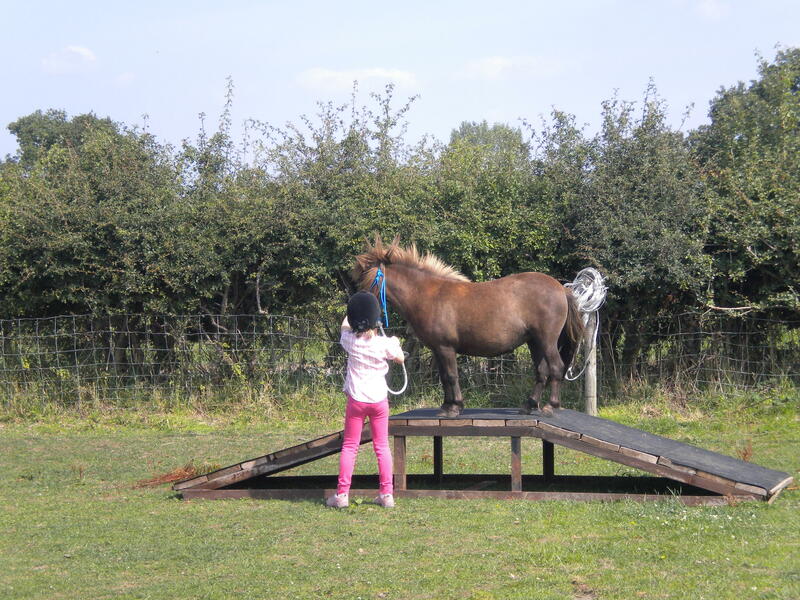 As well as Blue, there was Trigger, a Shetland pony prone to laminitis, whose owner wanted to find more options for exercising him, and Pip, a Welsh B whose teenaged owner was a little nervous and wanted to develop a stronger trust bond with her horse. Dawn started by laying out soft, flexible squares of matting, and asked us to lead the horses over them, placing their feet squarely on the mats. Blue was unhappy about stepping on the matting, and kept lengthening her stride to walk over it. She remained relaxed though, and after many repetitions, she was happy to place a hoof on the mat. Some of the other handlers went to walk their horses over plastic tub lids, which make more noise. I decided not to do this with Blue, as she’s very nervous about anything touching her legs, and I was worried about the lid flirting up and hitting her. Next, Dawn placed a large hula hoop on the ground. The horses were to place their front feet in the ring and stand quietly, then walk through and leave their back feet in the ring. The hoop itself was filled with beads so that it rattled if touched. Blue was surprisingly good, even when she knocked the hoop and made it rattle. Barbara and Blossom demonstrate the archway. Photo courtesy of D. Roberts. The next challenge was a ‘bridge’, made from tarpaulin laid taut between two jump poles. I thought that Blue would try to jump it, but she showed no inclination at all. She stood quietly and watched Trigger the Shetland walk backwards and forwards several times, and was then happy to walk right up to it. When I asked her to go forwards and place a foot on the tarpaulin, she retreated, but was happy to step up again without panicking. Eventually, she stood with her head hanging over the tarpaulin and her feet still in the arena. Dawn was pleased with this, as it showed that she was comfortable with exposing vulnerable areas to the obstacle. Gradually, she put a foot onto the ‘bridge’ and immediately withdrew it. I allowed her to retreat, as per Dawn’s instructions, before asking again, and waiting until she wanted to move forwards of her own accord. Suddenly, she decided to take the plunge, and moved smoothly over the obstacle. I immediately led her round and over again, and we repeated several more times in each direction until she was moving without hesitation. The last obstacle was a rough triangle made from three jump poles, filled with empty, squashed plastic drinks bottles. The smaller ponies made short work of this, bouncing through and ignoring the jumping bottles, but I decided to let Blue finish with the bridge obstacle rather than push her too hard. Finally, Dawn stretched a rope across the arena, and asked us to trot up to it in a row, then stop with our horses’ front feet as close to the rope as possible. Blue ended the session very relaxed, and didn’t seem phased by anything she was asked to do. I’d definitely recommend horse agility for improving the relationship between you and your horse, and also for adding a little variety to inhand schooling session. 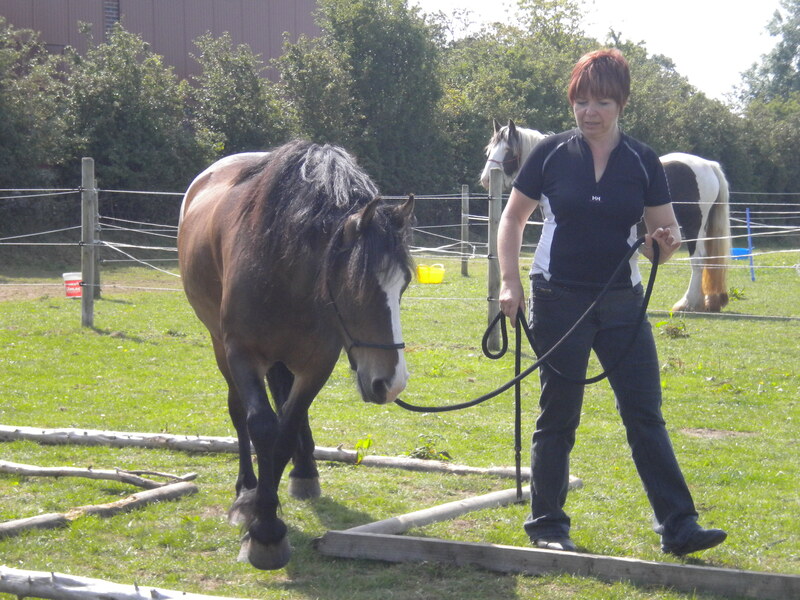 For details of instructors, or for more information about horse agility in your area, see www.thehorseagilityclub.com.